Istanbul will host a special neurological event May 31 to June 3. It will be the first and only joint congress of the European Federation of Neurological Societies (EFNS) and the European Neurological Society (ENS). This will be a special event for two reasons. First, the meeting itself: The missions of both the EFNS and ENS include promoting excellence in neurology throughout Europe. 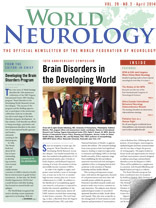 The practice of neurology rests upon both tradition and progress. Tradition means refined semiology based on clinicopathological correlations. Neurologists are the geographers of the nervous system. Their obsession is localization. Progress means science by which neurology moves from diagnosis to pathophysiology and treatment. Being present in Istanbul will allow neurologists to share their experiences and learn from colleagues from all parts of the world through 25 teaching courses, eight symposia, 23 focused workshops, five special sessions, three practical sessions, three interactive sessions and many satellite symposia. More than 2,000 oral and poster communications will be presented. Every subfield of neurology will be addressed. Visit JointCongressofEuropeanNeurology.org for information. The second reason for being in Istanbul is that it will be a historical landmark in neurology. Both current European neurological societies will found the EuropeanAcademy of Neurology (EAN) that will, starting in Istanbul, be the unique European society covering all fields of neurology. The EAN board of directors, including its first president, will be elected on June 3 by an assembly of 90 delegates, 45 appointed by national societies (the EFNS root) and 45 elected by ENS individual members (the ENS root). It is symbolic that this event will happen in Istanbul pointing out that the EuropeanAcademy of Neurology will be an open society, open to interaction with patient organizations, open to other fields of medicine, open to cutting-edge basic and clinical neuroscience and open to other parts of the world through its commitment to the World Federation of Neurology. The first EAN Congress will be June 20-23 in Berlin. This is another major event that neurologists should not miss. We look forward to seeing you in Istanbul!